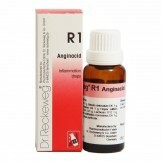 The R-1 Inflammation Drops consists of active ingredients like Apis mellifica 4X, Baryta muriatic 6X, Belladonna 4X, Calcareaiodata 4X etc. This homeopathic medicine is for a temporary but immediate relief of symptoms of cold including fever, body pain, and sore throats. It helps people who are suffering from colds and helps them to feel better and much healthier. Adults and children who are 12-years or older must take 5-10 drops 2-3 times daily. Children between the ages of 6-11 years must take 3-5 drops 2-3 times daily. Children between the ages of 2-5 years must take 2-3 drops 2-3 times daily. Discontinue usage of the product if irritation or redness occurs. 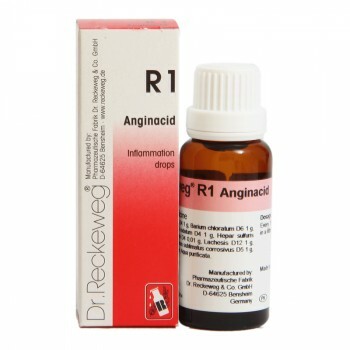 Offering the R-1 Inflammation Drops 22ml with fast shipping in Karachi, Lahore, Islamabad, Rawalpindi, Peshawar, Quetta and many other cities of Pakistan.